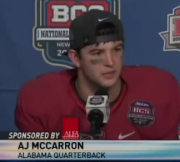 McCarron and freshman wide receiver Amari Cooper, torched the Vols all night. Cooper also had a career night with 162 yards receiving and two touchdowns. If the Tide wasn't passing its way into the endzone, it was rushing there. Freshman running back T.J. Yeldon had another 100-yard game and a touchdown. Even when it seemed the Tennessee offense would move the ball, the Bama defense would stop them dead in their tracks forcing the Vols to turn the ball over or settle for field goals. The game wasn't perfect for the Tide, there were a few miscues on special teams, but according to head coach Nick Saban, this might have been the Tide's best performance of the season. The Tide will now prepare for homecoming and the up and coming Mississippi State Bulldogs who will enter this game undefeated and tied for first with the Tide in the SEC West.